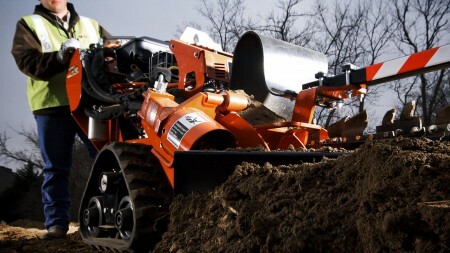 The Ditch Witch RT12 walk-behind trencher is powered by an 11.7-hp (8.7-kW) Honda® engine and offers a choice of high-flotation tires or heavy-duty DuraTrak™ track assembly. Exceptionally reliable and durable Honda engines power the RT12, RT20 and RT24, while the RT16 offers an economical and reliable Briggs & Stratton®Vanguard™ engine; all models equipped with electric starters. 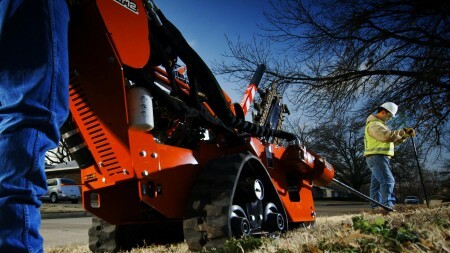 Heavy-duty components include a drive linkage that is built to last and designed to simplify operation and maintenance. Standard outboard bearing support stabilizes and supports the headshaft and auger, for reliable productivity trench after trench. 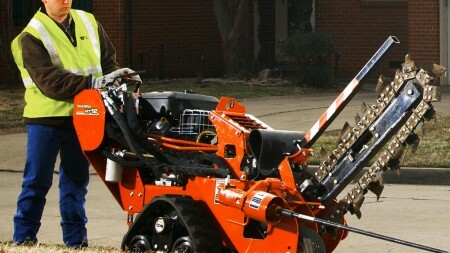 Easy hand controls: one hand for mobiling, two hands for trenching; all controls—including engine throttle, chain-engagement and boom lift—are grouped conveniently at the operator’s station. 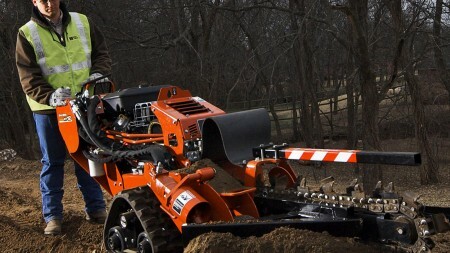 No belts to maintain—or break—because Ditch Witch walk-behind trenchers are equipped with direct-driven hydraulic pumps, independent ground-drive hydrostats, and a hydraulic gear pump for auxiliary functions. Your choice of high-flotation tires or heavy-duty tracks, both of which provide the stability and traction to drive across trenches, curbs and rough terrain; oscillating tracks “walk” or oscillate 12 degrees, for extra stability. Solid-rubber trail wheel increases stability when traveling over uneven and rough terrain, reduces breakover when loading and unloading and improves leverage when trenching. 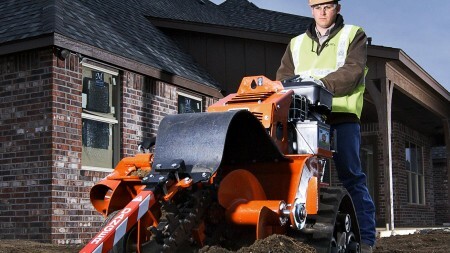 Optional, affordable backfill blade is easy to install and reduces cleanup time and manual labor.